Chambers and Chambers Wine Merchants, representing family-owned and operated wineries, is celebrating 40 years this year. 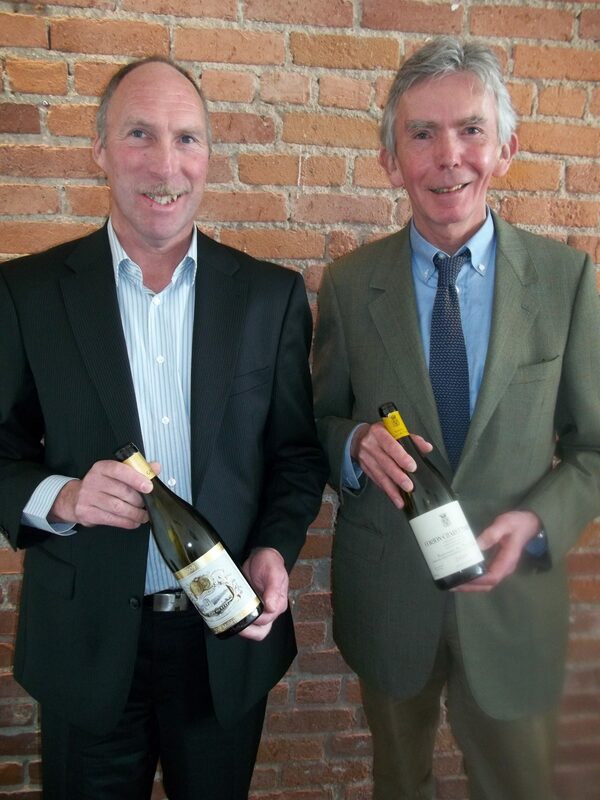 Began in 1973, their portfolio includes wines from California, Washington, Oregon, Argentina, France and Italy. I had to privilege to work as a sales rep for Chambers and Chambers more than seven years ago. While I only worked for them for less than a year, it was a great experience as I was introduced to amazing winemakers and wineries from around the world. This past week, many of these winemakers and principals came to Los Angeles from Europe, South America and the West Coast to showcase their wines and celebrate the anniversary. If only there had been more time to taste all of these amazing wines!!!! Happy Anniversary and here’s to another 40 years! Sitting down to a flight of wines from Burgundy is always a luxury. But, to taste through two vertical line-ups from two historic producers from the region is a special treat. 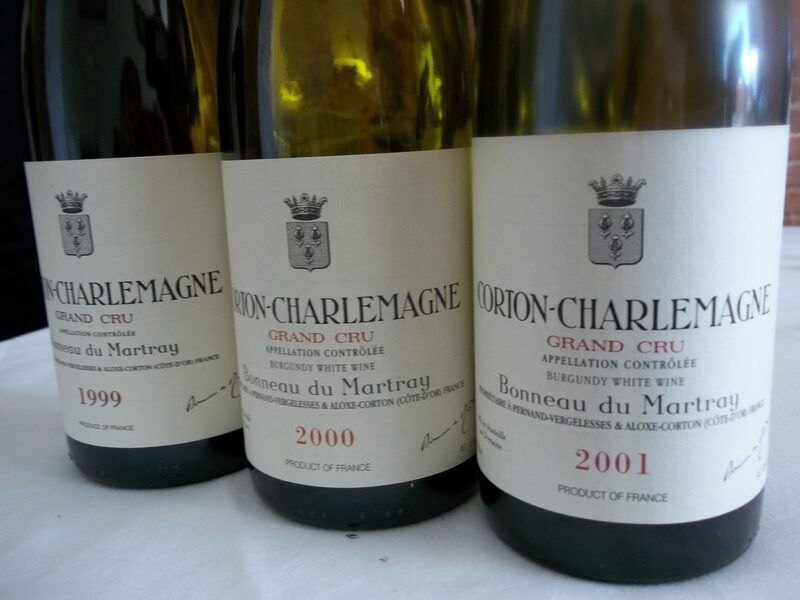 And such happened when two grand names of Burgundy recently visited Los Angeles to host a tasting – Michel Gros of Domaine Michel Gros and Jean-Charles le Bault de la Moriniere of Bonneau du Martray. The Burgundy region is considered one of the best in the world. 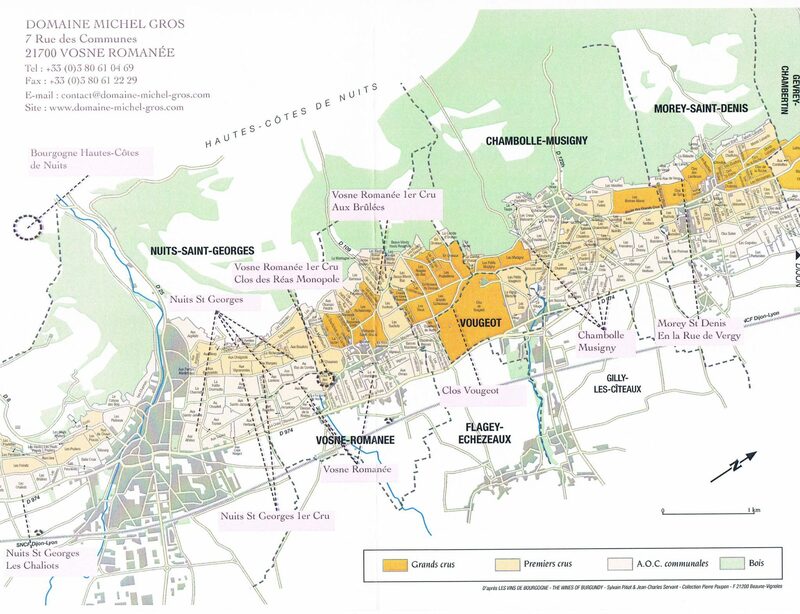 Consisting of 5 production areas that run north to south (Chablis, Côte de Nuits, Côte de Beaune, Côte Chalonnaise and the Mâconnais), Burgundy consists of thousands of small growers. 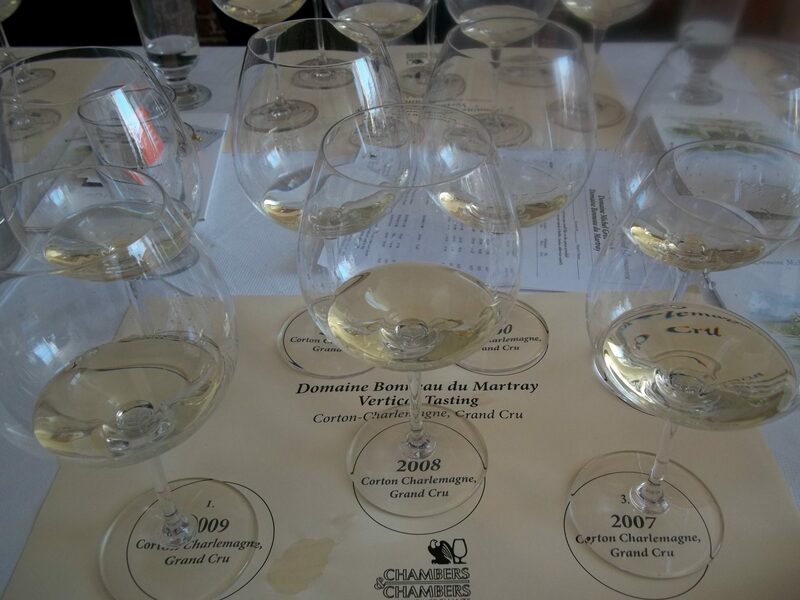 The great wines of Burgundy are single grape variety wines – one red (Pinot Noir) and one white (Chardonnay). The tasting including a vertical of Pinot Noir from Domain Michel Gros and a vertical of Chardonnay from Bonneau du Martray. 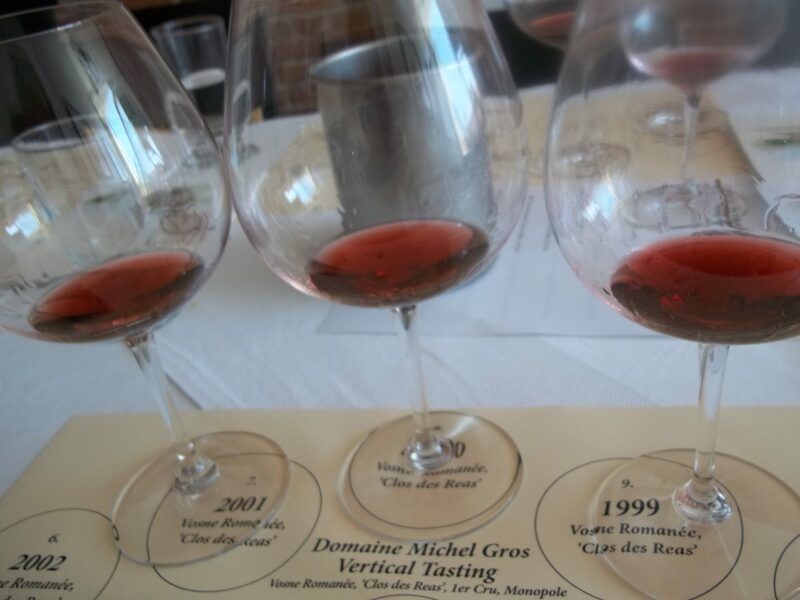 Michel Gros, who has been twice named the Red Winemaker of the Year, is the sixth generation in family who began in Vosne-Romanée (in the Côte de Nuits) in 1830. Michel began working with his father on the family estate in 1975 and today has land in the Cote de Nuits (Clos Vougeot, Vosne Romanee “Aux Reas”, Chambolle Musigny and Morey Saint Denis) and Côte de Beaune (Nuits Saint Georges). Clos des Réas is the oldest parcel in the family and consists of a total of approximately 5 acres. Located on the east side of Vosne-Romanée, the vineyard has its own special microclimate as it is protected from the north winds by the houses and walls around the vineyard. 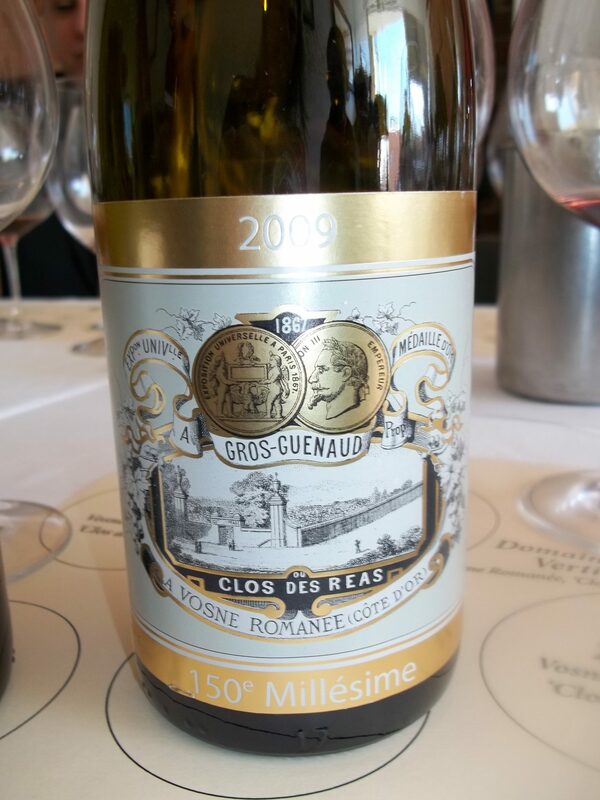 The 2009 bottle commemorates the 150th vintage with the Gros family seal. Family owned since the early 1800s, the vineyards of Bonneau du Martry are located on the hill of Corton in Corton-Charlemagne. Prior to the family owning the vineyards, they belonged to Charlemagne who donated the vineyards to the church in 1785. Since the family purchased the property in 1835, there have been only three owners in over 12 centuries. In 1994, Jean-Charles le Bault de la Moriniere took over for his parents and inherited viticulture methods that dated back to post World War II, in which agriculture was produced at a high-volume and at high speeds. Jean-Charles recognized the gradual erosion of the soils and the threat to the vineyards and got rid of chemical pesticides, cultivating the soils more naturally. Moving to organic farming in 2004, the winery, now 100% organic, is practicing biodynamic farming and will be certified biodynamic in 2014. There are 16 parcels, each farmed individually and picked separately, producing 16 different white wines, with nuanced differences. The wines clearly reflect the place that they come from. And it is the only estate in Burgundy to exclusively produce wine from Grand Cru vineyards.